Venezuela's President Nicolas Maduro speaks during his weekly broadcast "Los Domingos con Maduro" (The Sundays with Maduro) in Caracas, Venezuela, Aug. 6, 2017. Members of security forces stand outside the 41 Brigada Blindada Fuerte Paramacay military base in Valencia, Venezuela, Aug. 6, 2017. Maduro said “an active manhunt” was underway for those who escaped. Venezuela's chief prosecutor Luisa Ortega Diaz is seen in front of the public prosecutor's office in Caracas, Venezuela, Aug. 5, 2017. The government claims 8 million people voted on July 30 to elect the new assembly's 545 members. The opposition, which voters to boycott the election, said turnout was less than half as much as the government claimed. 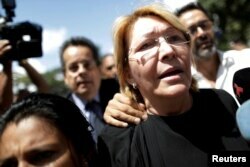 In addition, pre-election opinion polls showed about 70 percent of Venezuelans opposed the assembly. 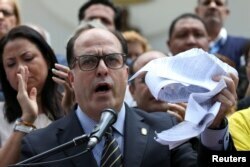 Julio Borges, president of Venezuela's National Assembly, waves a torn copy of the Supreme Court's decision at a news conference in Caracas, Venezuela, March 30, 2017. Changes will bring peace, stability? Maduro has said a new constitution will bring peace and stability. The opposition said the constituent assembly is packed with Maduro supporters — including his wife and son — and predicted it will try to dissolve the opposition-led national assembly and turn Venezuela into a socialist dictatorship. The United States has already imposed sanctions on Maduro and more could be on the way. The U.S., Canada, the European Union, and nearly all Latin American countries have refused to recognize the new constituent assembly.